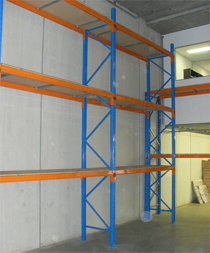 There are many different types of shelving ranging from Light to Heavy Duty applications. 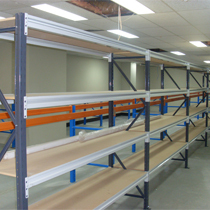 Pallet Rack Shelving uses Pallet Racking frames with various light and medium duty beams depending on load requirements of the product. This style of shelving can be beneficial for the business that likes to store their pallets directly above picking shelves for ease of restocking. 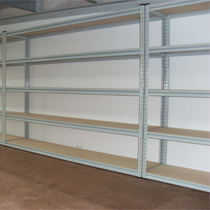 Rivet Shelving is a boltless shelving system. Rivet Shelving locks together using rivets on the shelving beams that slot into keyholes in the vertical posts. Much like the Long Span Shelving the shelving beams have a recessed inside edge so that the shelf site level with the top of the beam, eliminating an need for screwing the shelf down.